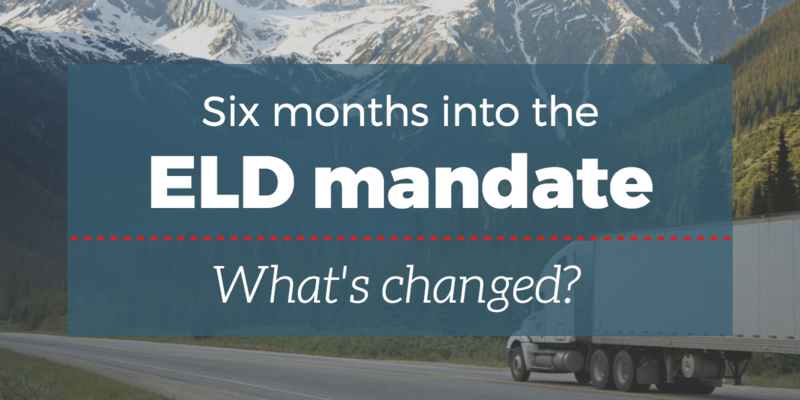 Six months into the ELD mandate: what's changed? Six months have passed since the ELD mandate for commercial vehicles, and the dust has yet to settle. The idea seemed fairly reasonable: ELDs (electronic logging devices) would track essential data points, including truck drivers’ hours of service. This measure aimed to increase safety by reducing the number of fatigued truck drivers on the road. The new technology was supposed to make the shipping process more efficient and transparent. So what effects of the mandate have we seen to date? The ELD measure was introduced in 2015, giving shippers and carriers a two-year head start to prepare for the new modus operandi. Come 2018, it seems the majority are still unprepared. But is the current situation the result of the government’s unreasonable request, or our instinct to stick to the “we’ve always done it this way” line of thinking? Let’s start by analyzing the initial impact of ELDs on U.S. roads. According to Business Insider, retailers are charging more for customers’ usual selections, and Amazon orders are taking longer to arrive. In supply chains, things get even more complicated. The new measure seems to have exacerbated the problems already bubbling under the surface. There's a critical shortage of truck drivers in the US at the moment. American Trucking Association (ATA) estimated that shippers were short 36,500 drivers in 2016. If the current trend continues, the shortage will grow to 174,000 drivers in less than a decade. How do ELDs make this situation worse? Download our free capacity guide here to learn the best strategies for reducing transportation costs and securing more capacity. Before the ELD mandate, the average truck driver’s 100-hour workweek was made of days like these: eight hours of driving, four to six hours of sleep while the receiving company unloads the truck, and another five-hour drive before calling it a day. With new limitations, this will not be a one-person job anymore. According to the ATA, supply chains will have to hire 900,000 drivers to keep up with demand. Those available at the moment are in a position to bargain for higher salaries—hence higher prices. According to a Zipline survey, truckload transit times grew by four hours after the ELD mandate took effect just over six months ago. This was especially true of deliveries in the 450-550 mile range. What is the large carriers’ ultimate solution? Trucking firms will have to increase prices to combat their newfound costs. Shippers now have to use extra equipment and extra workers to get the same amount of work done. Productivity, and therefore, prices, are still fluctuating as the carriers work to consolidate their new networks. According to a Zipline Logistics survey of ELDs’ first effects, smaller carriers have been steering clear of shipments longer than 450 miles. This may be reason for concern, given that the majority of active carriers in the US have fewer than six trucks, JOC.com reports. The distribution center network is already under tremendous pressure as the blossoming e-commerce industry drives up demand. Storing products and shipments in satellite, last-touch locations close to the on-call carriers is one way the small trucking firms can try to compete with large carriers. As we look closer into the carriers’ knee-jerk reaction to the ELDs, it appears the source of the present troubles and general unpreparedness comes from the way the supply chain overlooked some aspects of driver time management. The ELD mandate has increased the tremendous pressure truckers carry on their backs as a component in the bigger supply chain. Many of them feel more responsibility on their end from the very mandate that was meant to protect them. "The electronic logs are supposed to make it safer, but really it has created a hazardous race to beat the clock," Nashville truck driver Steve Manley told Business Insider. "Drivers are now more reckless than ever trying to make it to their destination before the clock runs out with the mandatory breaks and such." But is this effect due to the ELD mandate, or merely the result of poor logistics planning? This question offers an opportunity for soul-searching. As increasing demand drives the supply chain towards ever tighter deadlines, it is neither reasonable nor safe to expect carriers to drive at warp speed for 15 hours a day. This is why supply chain managers should follow three guidelines to change the ELD mandate into an opportunity for growth. Digitization does not end with ELDs. Digitization is meant to create both a detailed and broader picture of the supply chain and blends it into an effective strategy. Instead of chasing one or two dots—in this case, trucks—supply chain managers can analyze the critical points and examine how to manage time more productively. The purpose of the “demand-driven supply chain” digital model is not a mere assessment of the situation—it is the prediction. As real-time data loops back into the earliest parts of the supply chain, logistics managers can immediately notice surges in demand and minimize the possibility of chokepoints. Despite these possibilities, many supply chains still rely on “just-in-time” practice, putting the entire business at significant risk each time something unpredictable happens. Carriers and companies had a two-year head start to prepare for ELD, but most of them still seem surprised, mostly because it is hard to shake off decades-old business practices. The answer is education, especially in the upper echelons and crucial parts of supply chain management. As long as one segment does not have an insight into inner workings of the other part of the chain, there can be no synchronized strategy. The ELD mandate is another instance showing how proper logistics management is an integral part of the supply chain. It is also a great chance to drive positive changes in the industry through innovation and good organization. If this seems overwhelming, you don’t have to go through this journey alone. At CAI, we pride ourselves on being the ultimate solution for our customers. We do that by staying alert to the changes in the industry and adapting to new business practices quickly to respond to the changing needs of our customers. Contact us today to learn more.